3 Hrs 15 min. 2500 Bht. Spa Room. Detail : This ritual combines two of our most successful treatment to provide you an ultimate memory. Begin with a Foot Spa treatment following by Aromatherapy Oil Body Massage to soothe your body and finishing by a rejuvenating Facial Massage. 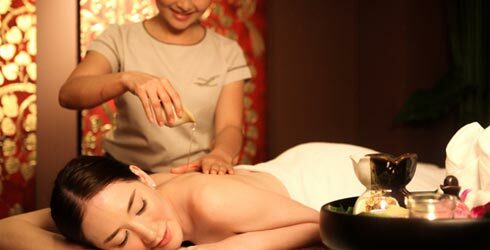 Thai herbs Body Scrub, Hot oil Aromatherapy Body Massage. 2 hrs. 1900 Bht. Spa Room. Detail : Begin your journey with a Coconut Body Scrub followed by a Virgin Coconut Oil Body Massage to moisture to soften and firm skin tone and texture. This treatment is recommended for dry skin. 2 hrs. 1700 Bht. Spa Room. Detail : Begin with a unique full Body Scrub to exfoliate and gently remove dull surface skin cells. The ritual leaves the skin clean, soft all over and facilities the blood circulation. Finish the experience with an Aromatherapy Oil Body Massage to promote a feeling of well-being for the body, mind and spirit.